If you've strolled down Flushing recently, you may have noticed Norwind's, an as-of-yet unopened beer garden nearing renovation completion, located at 1043 Flushing Ave, directly in between King Noodle and The Narrows. The proprietors could not be reached for comment, but preparation of the space appears been ongoing for about six months, and according to Community Board 1 records, the business applied for its liquor license last June and obtained it in August (it went into effect in late January of this year). The large interior is still undergoing renovation. However, the adjacent courtyard, which is furnished with with big picnic tables in classic beer garden style, looks ready for patrons! 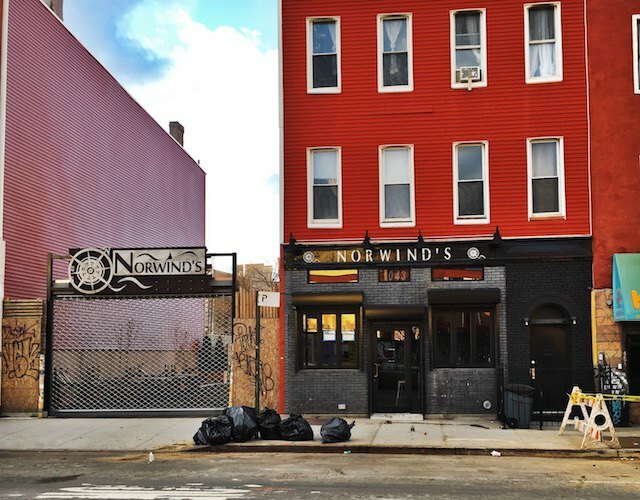 This is hardly the first new watering hole in Bushwick, but Norwinds looks like it's going to be a great outdoor option, with warmer weather just around the corner. Stay tuned for news of an opening date: Bushwick Daily will continue to report as more information comes to light. Norwind's is located at 1043 Flushing Ave. Hours, telephone, and website TBA.